There were more than 100 presentations at ABLC last week and not a clunker amongst them, but if I were to point the reader’s attention at one or two that stood out from the rest because of the short-term or long-term implications, I’d start with the news from Aemetis that they are embarking now on a $158 million cellulosic ethanol plant — to be built in Riverbank, California, in partnership with LanzaTech. Cellulosic ethanol is selling for such a high price in California right now — the value jumps north of $4.00 per gallon at times — that any producer of conventional ethanol is going to see the market opportunity. The current market price of cellulosic ethanol sold in California is estimated to be $3.00 more per gallon than conventional ethanol. The key is getting it done and making it happen. And something very special to that end is underway in central California right now. If you’ve driven the smoke-filled San Joaquin Valley — America’s breadbasket — you’ll know that someone is burning something in awfully big quantities, and that something is, more or less, orchard waste — much of it from the explosion of almond cultivation in the Valley. Value is going up in smoke, clean air too. 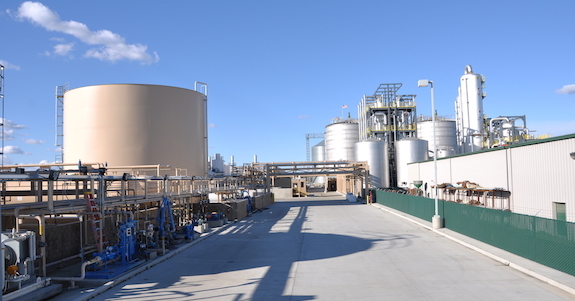 For the demonstration unit, Aemetis used waste orchard wood and nut shells from almond and walnut trees as feedstock, gasified the biomass using a high temperature plasma gasification system to produce synthesis gas (“syngas”), cooled and cleaned the syngas, and supplied the syngas to a patented gas fermentation bioreactor to produce an ethanol broth. The broth was subsequently distilled to produce commercial grade ethanol. As an aside, San Joaquin Air Quality Management held a conference last Fall declaring a “Air Pollution Crisis caused by Waste Orchard Wood Burning”. Aemetis owns and operates a 60 million gallon per year ethanol production facility in California’s Central Valley, near Modesto. Aemetis also owns and operates a 50 million gallon per year renewable chemical and advanced fuel production facility on the East Coast of India producing high quality distilled biodiesel and refined glycerin for customers in India, the US and Europe.